Greetings! I hope that you and your loved ones have had wonderful holidays. I want to take this opportunity to thank you all for your support and friendship during this past year and throughout the years. I am still in touch with some of you who started visiting the galleries in Stockbridge and Palm Beach in the late 1970’s and 1980’s. 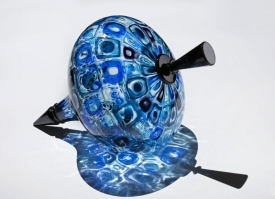 Contemporary glass art has evolved so much since that time and I feel fortunate to have been able to know many of you and many of the artists responsible for this evolution. I particularly would like to thank Dale Chihuly and Lino Tagliapietra for their immense contributions to this body of art and knowledge. I wish you and your families peace, joy and abundance in the year ahead and look forward to staying in touch as we continue this grand adventure called glass art! Nancy Callan has created many new and interesting forms over the past few years but my favorite series is still her “Tops.” Since blue is also my favorite color then it’s not difficult to understand my choice of “Electric Blue Murine Top” to include in this month’s featured works. Many of Stephen Powell’s pieces would fall into a category that I would call color field painting in glass. As bold as the form of this piece is, I find it equally compelling to focus on the bands of color, how the colors fade into each other and at the same time play off of one another. The exaggerated long thin neck gives this piece an uplifting quality that feels almost musical to me, if I can be allowed to mix my senses in that way. 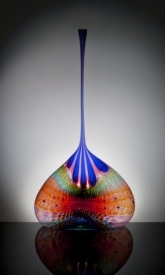 7.5" x 11" x 10"
This new piece by Hiroshi Yamano is typical of the elegance and refinement of his glass art. I would be happy to send more images from different angles if you find this piece of interest. Thank you for taking a few moments to view these beautiful works of art. As always, I would be happy to hear your comments and questions. Take care and stay well!